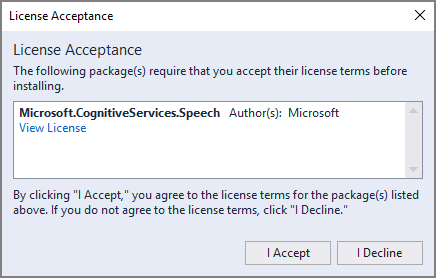 The Cognitive Services Speech SDK integrates with the Language Understanding service (LUIS) to provide intent recognition. An intent is something the user wants to do: book a flight, check the weather, or make a call. The user can use whatever terms feel natural. Using machine learning, LUIS maps user requests to the intents you have defined. A LUIS application defines the intents and entities you want to recognize. It's separate from the C# application that uses the Speech service. 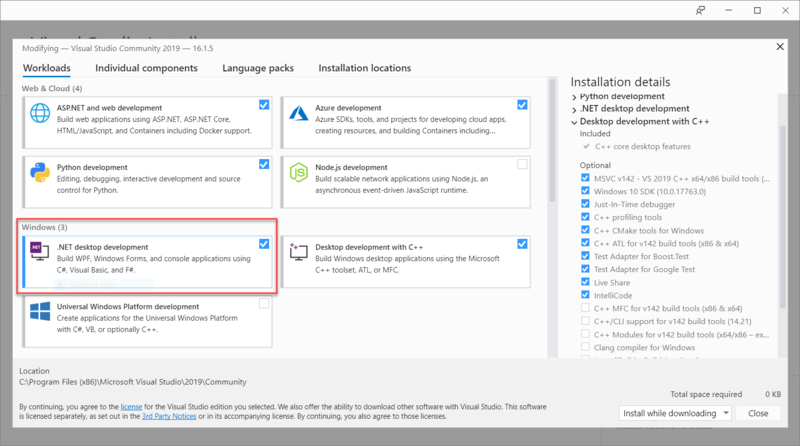 In this article, "app" means the LUIS app, while "application" means the C# code. Be sure you have the following before you begin this tutorial. A LUIS account. You can get one for free through the LUIS portal. Visual Studio 2017 (any edition). LUIS integrates with the Speech Services to recognize intents from speech. You don't need a Speech Services subscription, just LUIS. The endpoint key is the LUIS key needed for this tutorial. This tutorial uses the example Home Automation LUIS app, which you can create by following Use prebuilt Home automation app. If you have created a LUIS app of your own, you can use it instead. When you create a LUIS app, a starter key is automatically generated so you can test the app using text queries. This key does not enable the Speech Services integration and won't work with this tutorial. 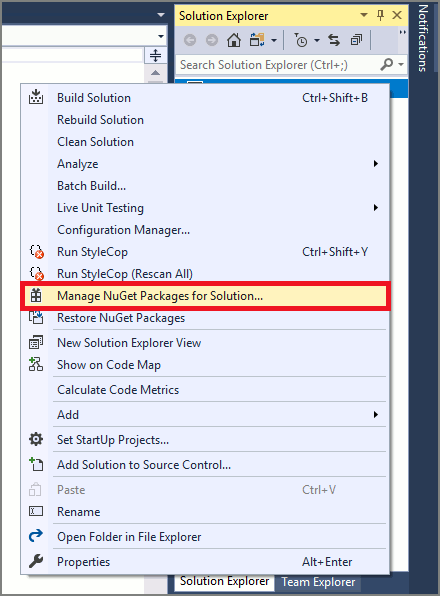 You must create a LUIS resource in the Azure dashboard and assign it to the LUIS app. You can use the free subscription tier for this tutorial. After creating the LUIS resource in the Azure dashboard, log into the LUIS portal, choose your application on the My Apps page, then switch to the app's Manage page. Finally, click Keys and Endpoints in the sidebar. Scroll down to the Resources and Keys section and click Assign resource. Choose Microsoft as the Tenant. Under Subscription Name, choose the Azure subscription that contains the LUIS resource you want to use. Under Key, choose the LUIS resource that you want to use with the app. 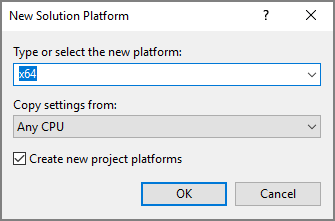 Open the file Program.cs in the Visual Studio project and replace the block of using statements at the beginning of the file with the following declarations. Inside the provided Main() method, add the following code. Create an empty asynchronous method RecognizeIntentAsync(), as shown here. In the body of this new method, add this code. // requires a specific subscription key from https://www.luis.ai/. // The Language Understanding service calls the required key 'endpoint key'. // The default language is "en-us". // Creates an intent recognizer using microphone as audio input. Replace the placeholders in this method with your LUIS subscription key, region, and app ID as follows. YourLanguageUnderstandingSubscriptionKey Your LUIS endpoint key. As previously noted, this must be a key obtained from your Azure dashboard, not a "starter key." You can find it on your app's Keys and Endpoints page (under Manage) in the LUIS portal. YourLanguageUnderstandingServiceRegion The short identifier for the region your LUIS subscription is in, such as westus for West US. See Regions. YourLanguageUnderstandingAppId The LUIS app ID. You can find it on your app's Settings page of the LUIS portal. With these changes made, you can build (Control-Shift-B) and run (F5) the tutorial application. When prompted, try saying "Turn off the lights" into your PC's microphone. The result is displayed in the console window. The following sections include a discussion of the code. The first step in recognizing intents in speech is to create a speech config from your LUIS endpoint key and region. Speech configs can be used to create recognizers for the various capabilities of the Speech SDK. The speech config has multiple ways to specify the subscription you want to use; here, we use FromSubscription, which takes the subscription key and region. Use the key and region of your LUIS subscription, not of a Speech Services subscription. Next, create an intent recognizer using new IntentRecognizer(config). Since the configuration already knows which subscription to use, there's no need to specify the subscription key and endpoint again when creating the recognizer. Now import the model from the LUIS app using LanguageUnderstandingModel.FromAppId() and add the LUIS intents that you wish to recognize via the recognizer's AddIntent() method. These two steps improve the accuracy of speech recognition by indicating words that the user is likely to use in their requests. It is not necessary to add all the app's intents if you do not need to recognize them all in your application. Adding intents requires three arguments: the LUIS model (which has been created and is named model), the intent name, and an intent ID. The difference between the ID and the name is as follows. intentName The name of the intent as defined in the LUIS app. Must match the LUIS intent name exactly. intentID An ID assigned to a recognized intent by the Speech SDK. Can be whatever you like; does not need to correspond to the intent name as defined in the LUIS app. If multiple intents are handled by the same code, for instance, you could use the same ID for them. The Home Automation LUIS app has two intents: one for turning on a device, and another for turning a device off. The lines below add these intents to the recognizer; replace the three AddIntent lines in the RecognizeIntentAsync() method with this code. Instead of adding individual intents, you can also use the AddAllIntents method to add all the intents in a model to the recognizer. With the recognizer created and the intents added, recognition can begin. The Speech SDK supports both single-shot and continuous recognition. Single-shot RecognizeOnceAsync() Returns the recognized intent, if any, after one utterance. StopContinuousRecognitionAsync() Recognizes multiple utterances. Emits events (e.g. IntermediateResultReceived) when results are available. 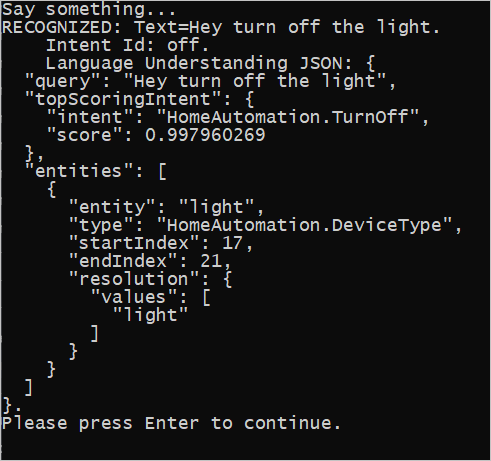 The tutorial application doesn't parse the JSON result, only displaying it in the console window. By default, LUIS recognizes intents in US English (en-us). By assigning a locale code to the SpeechRecognitionLanguage property of the speech configuration, you can recognize intents in other languages. For example, add config.SpeechRecognitionLanguage = "de-de"; in our tutorial application before creating the recognizer to recognize intents in German. See Supported Languages. The following code illustrates two additional capabilities of intent recognition using the Speech SDK. The first, previously mentioned, is continuous recognition, where the recognizer emits events when results are available. These events can then be processed by event handlers that you provide. With continuous recognition, you call the recognizer's StartContinuousRecognitionAsync() to start recognition instead of RecognizeOnceAsync(). The other capability is reading the audio containing the speech to be processed from a WAV file. This involves creating an audio configuration that can be used when creating the intent recognizer. The file must be single-channel (mono) with a sampling rate of 16 kHz. To try out these features, replace the body of the RecognizeIntentAsync() method with the following code. // Creates an intent recognizer using file as audio input. // The TaskCompletionSource to stop recognition. Revise the code to include your LUIS endpoint key, region, and app ID and to add the Home Automation intents, as before. Change whatstheweatherlike.wav to the name of your audio file. Then build and run. 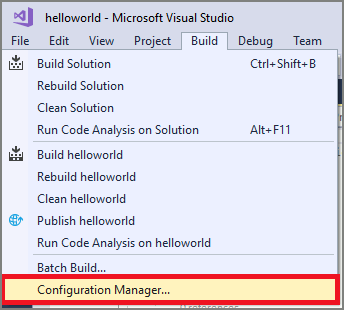 Look for the code from this article in the samples/csharp/sharedcontent/console folder.